IT is the backbone of the modern business. But with an increasingly complex and interdependent technology landscape, it can be challenging to meaningfully improve IT operational performance. In this webinar, learn how leading enterprise IT organizations employ advanced analytics to generate deeper insights and drive smarter decisions while delivering greater value to the business. 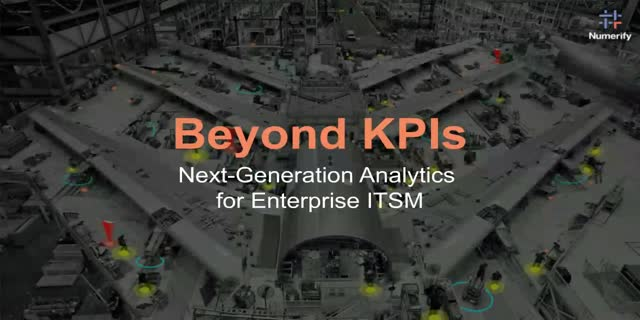 KPIs are important, but alone they fail to provide the insights necessary to run modern IT organizations. We’ll review traditional KPI’s used by IT Service Management, what questions they answer, and where they fall short. Then, using real uses-cases, we’ll introduce 5 new measurements IT can employ to drive improvement and efficiency, improve service levels, and deliver true business value. Let’s say your IT organization has processes in place that seem effective on the surface — you resolve service outages, provision resources, and manage changes as required. Your monthly reports may satisfy IT executive requirements, but how aware are you of your business customers’ needs and service expectations in relation to these processes? In their initial efforts to define IT service delivery processes, many organizations have unintentionally pushed customers to the end of the equation. Aligning interdependent resources and workflows is crucial for IT operations to be successful — but not at the expense of the customer. Too frequently, IT faces excessive pressure to deliver business metrics, and not enough significance is placed on the goals and values of the customers. Join Troy DuMoulin, VP Research & Development at Pink Elephant discusses how team misalignment can hinder service delivery. Watch to learn how they progressed along their journey towards greater IT analytics, while also keeping costs abay. Numerify Analytics helped Palo Alto Networks achieve streamlined efficiency not just within their IT department, but also within the entire organization as well, allowing them to achieve their goals and set larger targets. See how the adoption of Numerify and Tableau has helped foster strong business-IT partnership and employee engagement within their organization in this exclusive webinar. Learn how to move beyond theory and instead map out process performance to help you achieve meaningful goals. Every IT organization accumulates an abundance of data — overwhelming analysts with a constant flood of numbers. However, many teams are challenged to translate that data into tangible value that aligns with business goals. The right framework of metrics, KPIs, and analyses will enable organizations to unlock insights trapped inside their data. Join Pink Elephant’s VP of Research & Development, Troy DuMoulin, and Numerify’s Director of Product Marketing, Mark Gabbard, for this thought leadership webinar. Numerify provides IT leaders with a comprehensive system of intelligence for end-to-end visibility into their Plan-Build-Run activities. The suite of analytical applications span project planning, software development, and service and asset management. The company’s cloud-based platform includes full data orchestration, IT-specific business models, and a complete spectrum of analytical capabilities. Numerify provides IT business analytics applications to leading organizations, including companies ranked in the top 5 across 10 major industries. For more information, visit www.numerify.com or follow @numerify.